Russian chess grandmaster Sergey Karjakin. Sergey Karjakin is the youngest grandmaster in history, and as of February 2017 he is ranked No. 9 in the world. He’s highly sought after by sponsors, gets invited to glamorous parties, and is received by high-ranking officials. He is great but we are not daunted. RBTH sparred with Sergey Karjakin right during the interview. Sergey Karjakin is the most famous Russian chess player of the young generation. His world championship match in November 2016 was watched by tens of millions of people online. He is known for his ability to find a way out of the worst, almost hopeless chess situations, for his ideal poker face, and for his invariably polite and amicable demeanor. He is the opposite of the common stereotype of a chess player - no glasses, no sweater, no deep pensiveness, slouching or a chessboard under his armpit. Some consider Karjakin to be an extraordinary and successful business project; others think he’s purely a genius. We meet in a sports bar and try to avoid the tea-with-a-journalist format. We want to beat Karjakin or to at least drive him out of his comfort zone, and to that end we prepared a test for him. He asks calmly, looking at a huge plasma screen and a couple of joysticks. Naturally, it’s not virtual chess on the screen. We’ll play something not particularly intellectual … how about good old fighting. - I’ll just practice a little, ok? He quickly agrees and goes on to trash my character who is standing immobile at the center of the imperial palace. - I have absolutely no time for computer games because, first of all, I have tournaments and second, training for tournaments. To be honest, I think they are a waste of time. Karjakin’s Sub-Zero gets a powerful kick and the young grandmaster bursts out laughing. He claims I jinxed him and he chose the wrong character. - You know, as a child I spent hours playing Heroes III, and then I must have just grown out of it. 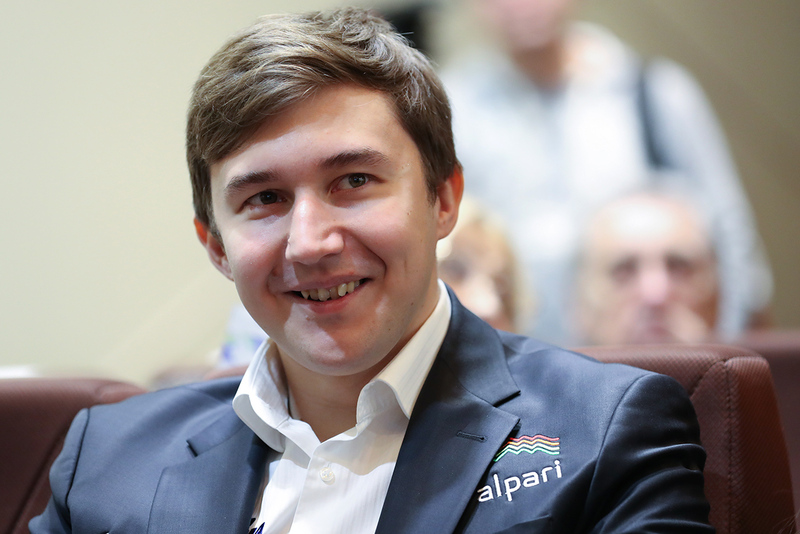 The Crimean-born Karjakin insists that his childhood in Simferopol was ordinary - with games, acrobatics, friends in the yard, and etc. However, he was home-schooled. During the interview he repeats several times: "I am a person just like you – I don’t like dealing with complicated things." This may be so, but by the time he was 10, Karjakin had already been to tournaments in 15 countries; at 12, he became the youngest grandmaster in history; and at 14, he won the Chess Olympiad, played for the national team of Ukraine, and five years later moved to Moscow. - I had practically no support in Ukraine. I am not even speaking of paying for coaches or covering the cost of training trips. There were no strong coaches there anyway. When in 2004 I won the Olympiad, the state paid us $3,000, before tax. - It was humiliatingly little. I even considered rejecting the reward. He now lives in the countryside outside Moscow, in Rublyovka, with pop stars and politicians for neighbors. He drives a new Mercedes, and his computer is protected by Kaspersky Lab - both brands are his sponsors. The names of his other sponsors are sewn on his jacket: Alpari, Russia’s forex market leader; and VSMPO-AVISMA, a major titanium producer. Yet, a mere five years ago, no private company wanted to invest in chess players. He and Zangalis fought to put an end to investors asking: "Why is this a sport and who needs this boring game?" For the tournament in New York, the most difficult in his life, a general sponsor was found just 48 hours before departure. After the tournament, there was no longer any difficulty with finding sponsors, even though Karjakin lost. - What went wrong? I must have made a mistake when I was leading in the score. At that moment, I should have finished Magnus Carlsen off, but instead I tried to get a draw and retreated into myself. Norway’s Magnus Carlsen is the current world champion. He is the same age as Karjakin. The two prodigies are constantly compared, like the eastern and western schools. Karjakin thinks Magnus could be invincible - he does not have any obvious weaknesses, and he is the most versatile chess player in history. But Karjakin has made some findings, which are a "big secret." - Do you have weaknesses? - I too consider myself to be versatile – I do not have that many weaknesses. For instance, Carlsen was a clear favorite, and yet in the end he was losing in the classical part of the tournament. - Doesn’t it irritate you that you are constantly compared? - Not any more, though it did a bit when I was a child. At the age of 14-15, I already was in the world’s top 100, while he was miles away. It seemed that he, shall we say, had too much in advance. But then he deservedly became No. 1. Karjakin’s strength is that it does not take him long to think; he comes up and immediately makes a move. Things that can take others five hours, take him an hour or two. And while my Kitana is beaten like a punching bag, I am told that to play against 70 opponents is normal, but to beat 70 opponents is very difficult. To come up to each of them and make a move, you have to cover a distance of 500 meters; do it at least 10 times and that’s already 5 kilometers. And this is pure sport. - What is your limit? - The age of 50 or 60, when my brain is not as quick as now. - And what then – politics or business? - So what is it, politics or business? - I haven’t decided yet. Everything will depend on the situation. In any event, it will have something to do with chess. I already have a chess school of my own affiliated with Moscow State University. He also has connections. He discusses chess with Kremlin press secretary Dmitry Peskov, and says he would be keen to play with President Putin if the latter could find the time. He’s friends with Deputy Prime Minister Arkady Dvorkovich, and he’s glad that Crimea is now part of Russia. The strategy he and Zangales developed still works - in 2018, they will challenge Magnus for the chess crown, and “of course, will take it”. Asked if it hurts to lose, he says "No.” And he shows his famous poker face. When the Norwegian lost one of the matches to Karjakin, he fled from the press conference. I ask Sergey what is the source of his equanimity. - It is important not to take everything close to heart. - Do you build a wall? - Something like that. Detachment effect. - Are you a perfectionist? - I don’t know… Could you make the question more specific? - Is it very important for you to be the first? To win? - Depends in what. In computer games I do not necessarily have to beat you, but I cannot deliberately play at give-away either. RBTH thanks the Match Point sports entertainment center for assisting in the video shooting.